Bored on a Sunday? 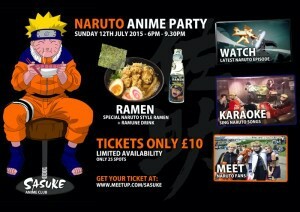 Would love to chill with your friends Watching Naruto, Eating Naruto Style Ramen and after a few Drinks singing your favorite Naruto song? – Listening to Naruto songs all evening. Spaces are limited to 25 people, So Be Quick!